The advent of servo-drive technology in mechanical stamping presses has changed the rules of engagement between metalformers and their customers. Simply, early adopters of servo presses soon will—if they haven’t already—leapfrog their competitors in the race to gain new customers. Throw everything you know—or think you know—about the ability to control a stamping press’s slide motion and the types of metalforming operations that can be performed under ram out the window. With servo-drive presses, metalformers can program stroke and slide velocity in any imaginable combination, to optimize performance for a given material and operation, whether it be blanking, coining or deep drawing. Servo motors, installed in place of the traditional flywheel/clutch drive train, allow the output shaft to be rotated in both directions. The press ram can stop precisely at any given position, and change speeds on a dime. • Dwell anywhere in the stroke, and at bottom-dead center (BDC), under full tonnage without energy loss. • Reduce cutting speeds and snapthrough forces without compromising productivity. • Control forming velocity to minimize friction and heat generation. • Reduce impact speed and noise. • Make multiple hits on the workpiece at or near BDC to reduce springback, useful when stamping advanced-high-strength steels for example. • Allow assembly and other secondary operations to occur under the ram, thanks to the ability to slow down or stop the press slide at any point in the stroke. 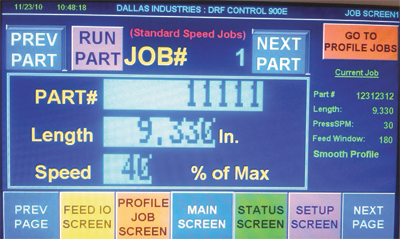 As these images from Dallas Industries illustrate, while the control for a coil feed installed on a conventional mechanical press (left) works from data input for feed length and speed (as a percentage of maximum), the feed control for a servo-drive press (right) is more interested in feed time (in msec.) and motion-profile type. 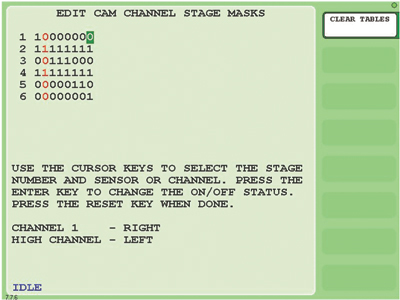 A—This screen allows the user to select which cams fire on which stages. The stages are listed on the left column (1-10)—in this example, only six stages are being used. The series of 1s and 0s indicate which cams will be active on each stage. The control stores separate sets of masking information (for sensors and cams) for each job. 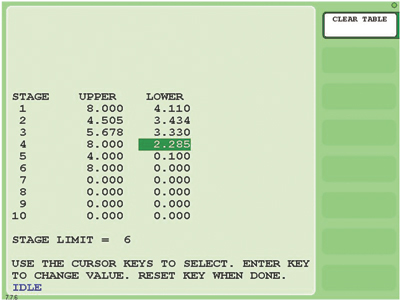 B—This programming screen addresses ram position. The user can select the stage mode (single or multistage) and the motion-curve type (sinusoidal, linear or one of three different asymmetrical curves). He also can set the upper and lower limits. 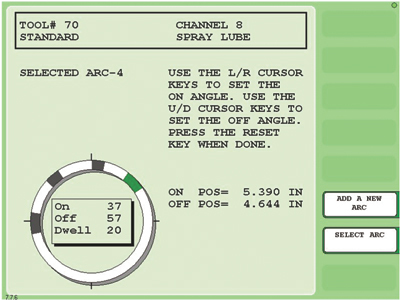 C—Here we see the programmable limit switch (cam) timing for channel 8, which—according to the mask shown in screen A—will turn on during the second, fourth and sixth stages of motion. 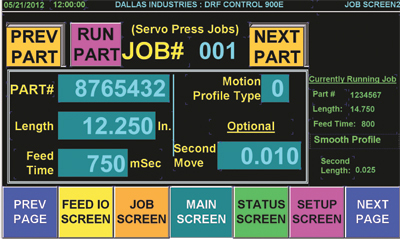 D—On this main run screen the operator can view the current stage, ram position and upper and lower ram limits. 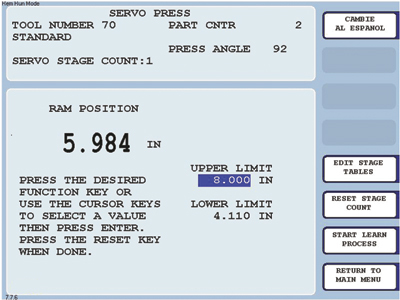 A function key allows him to start the self-learn process that allows the control to learn the stage motion for the job. 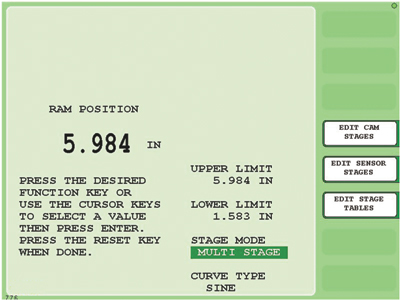 E—This screen shows the upper and lower ram limits for each programmed stage (six stages shown here). These values can be user-entered or can be automatically created as a result of the self-learn process. Much as increasing fuel-economy standards push automakers and their suppliers to push the technology envelope, so do the speed and flexibility gains realized by servo presses push suppliers of ancillary equipment to up their game. Riding the coattails of the rapid adoption of servo-drive presses, manufacturers of press controls, feeds and other equipment are working hard to keep up. Compared to a conventional crank press, servo-drive presses can run in completely different operating modes, such as pendulum back-and-forth motion. And, the ability to crank up the speed of a servo-drive press during ram approach and retract, and still form nice and slowly when the need arises, allows stampers to increase hit rate by a factor of two or more. Double (or more) the output without sacrificing quality—what stamper would not want to do that? But the reality of such a notable boost in output means there’s less time to perform all of the operations that go along with forming—feed and sensing, for starters. Speed constraint becomes most critical when metalformers operate a servo press in pendulum mode. “In this operating mode, completely unique to servo presses, we cannot only be concerned with acceleration and feed rate, and just play beat the press,” says Willie Chacko, CEO of feed supplier Dallas Industries. “In pendulum mode, there’s often precious little time available for us to fit in our motion profile to index the material before the next press stroke. What Chacko is alluding to is Dallas’ ServoPressSelect feed control, slated for release by year-end. He says the control will allow servo-press users to select from among five types of feed profiles to match the variety of tasks that a servo press can perform. As a result, the human-machine interface (HMI) of the new control looks different than that for the standard feed control. In place of feed speed (as a percentage of maximum), the control needs to know feed time (in msec.) and the motion-profile type. 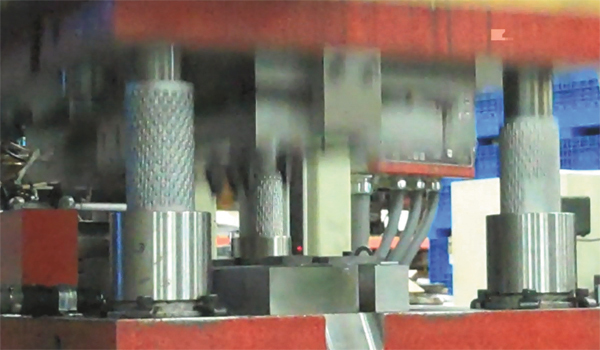 “Most stampers use the sinusoidal profile,” says Gentilia, “gradually ramping up feed speed during the first part of the feed cycle, then ramping down from peek speed at the end of the cycle. But stampers, as they become more familiar with the flexibility and opportunities afforded by servo presses, will realize some definite opportunities to use other profiles. Coe’s controls engineering manager Bruce Grant notes that the firm has installed a handful of its ServoMaster feeds onto servo presses in the last few years, and says that the time is now for stampers, press builders and feed suppliers to ramp up the dialogue on servo-press applications. Including gaining some understanding of how the presses will be used in the future. “This is a major shift in the process that affects everything going on under the ram,” Grant says. “We have several servo-press projects under for the second half of 2012 and into 2013, many of which we are addressing with our standard servo-feed control. But for the larger transfer-press applications, we’re going with a more flexible controls package—PLC-based with motion-drive networked packages customized to the feed-line automation and indexing process. For many, what’s coming is already here. “Some stampers are solving some previously unsolvable application problems thanks to the flexibility afforded by servo-drive presses,” says Jim Finnerty, product manager for Wintriss Controls LLC. “They’re forming materials once considered unformable, and making a lot of money as a result. Conventional timing methods used for flywheel/clutch-driven mechanical presses, where everything happens in a repetitive cycle through a complete revolution, will not work with servo presses. The activities in the press cell—feed, part off, etc.—all happen in a repetitive cycle with a conventional press, but with a servo press this might not happen. • Make it act like several different presses—short-stroke high-speed, longer-stroke slower-speed or some combination. Versatile but conventional. • Take full advantage of flexibility and variable programmability. 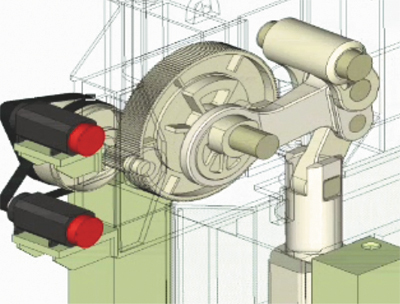 This screen capture from digital video footage of a servo-drive press in action, provided by Anchor Danly’s Ray Osborne, illustrates what can happen to ball-bearing cages when the ram accelerates rapidly from BDC and then reverses quickly from TDC. At this point in the stroke, the ram is rapidly accelerating downward just milliseconds after TDC. The cages have lost their timing and position, ultimately leading to performance problems and eventual damage to the retaining hardware. • Sinusoidal—closely approximates the operation of a standard part-revolution press. • Proportional—closely approximates the motion of a hydraulic press, with equal timing-adjustment increments throughout the stroke. • Asymmetrical—offering high-resolution programmability near the bottom of the stroke. The control can monitor and direct as many as 10 stages of slide motion, although Finnerty says even the most complex jobs experienced so far have required control of only five stages (defined as a change in slide direction, not speed). No need for the operator to enter parameters for each program—which can become quite complex for servo-press applications. For a final word on the new-found speed and flexibility arriving with the move to servo-drive presses, we spoke with Anchor Danly’s Ray Osborne, director of engineering for the maker of die sets and precision components. While total control of the ram and the ability to “do things that you can’t do in a conventional mechanical press can take stampers in directions never before experienced,” says Osborne, he also sounds a note of caution. To illustrate, Osborne describes a servo-press installation where he recorded digital video to illustrate what can happen to ball-bearing cages when the ram accelerates rapidly from BDC and quickly reverses direction from TDC. It’s not a pretty sight. There are options for dealing with this condition, explains Osborne, in particular changing the length of the guide pin or bushing to ensure the ball bearings unload as close to TDC as possible. Or, the stamper can select a combination of components that ensures some bearings are als under preload—commonly referred to as Type 1 operation. But, as many stampers know (particularly those working in the high-speed canning industry), Type 1 operation often can lead to a phenomenon called “cage creep.” This, explains Osborne, refers to the tendency of a rolling-element retainer cage to gradually deviate from its nominal TDC and BDC positions. Certain measures must be taken to guard against cage creep. As described above, equipment suppliers must find s to support stampers that take the leap to servo-drive presses. And guide components are no exception. To address the retainer-cage issue described by Osborne, he told us of a patent-pending prototype guidance system Anchor Danly has in field testing that prevents the cage from ever being in freefall. “With cam-slide units, after the work has been done and the press is on the upstroke, you’re sometimes at the mercy of the cam’s slide-return system,” Osborne says. “Stripping force is critical; give the springs enough time to work. Upstroke too quickly and you can prematurely wear, or even break, punches. Yes, this can occur in a conventional press, but the situation is exacerbated with a servo-drive press and the temptation to crank up the speed after BDC.